Most of my readers will know already that I am a regular contributing writer for Childhood 101. Well, today our writing team is bringing you a rousing game of tag! We have all written a post for each other’s blog and we’ve all gone live at the same time. When you get down to the bottom of the post, you click thru to the blogger that I have tagged. When you are finished with that one, you can move through to the blogger that was tagged next! Repeat until you’ve come full circle! Oooo…this is going to be good! So many wonderful posts for you to see! 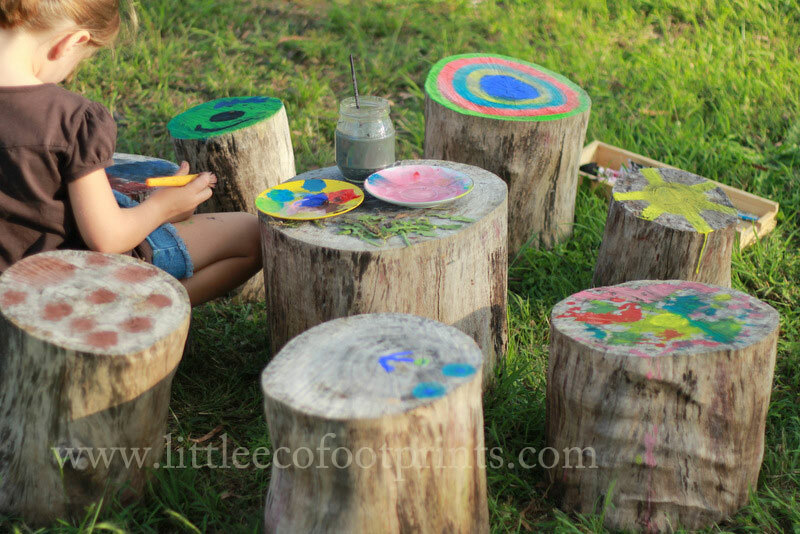 So without further ado, I’d like to introduce Tricia of Little Eco Footprints. Tricia is our very first guest blogger on Small Potatoes and I am thrilled to have her here…. Materials for art and craft have always been freely available in our home. Paint, paper, glue, chalk cloth and scissors are not tucked away out of reach but rather are easy for my daughter to access. This freedom to create whenever she chooses has led to some interesting messes, but more importantly, I believe it has contributed to her blossoming independent creativity. At six, I rarely initiate art or craft, but regularly find her absorbed in her latest artistic creation. I’ll notice its quiet and then discover her in her child-sized corner crafting, or at her desk drawing, or outdoors painting. These spaces, set up just for her, have been a vital ingredient in nurturing her independent creativity. We’ve recently moved, so these child-sized spaces look a little diffident, but their ingredients are still the same and they are still a prominent feature of our home. 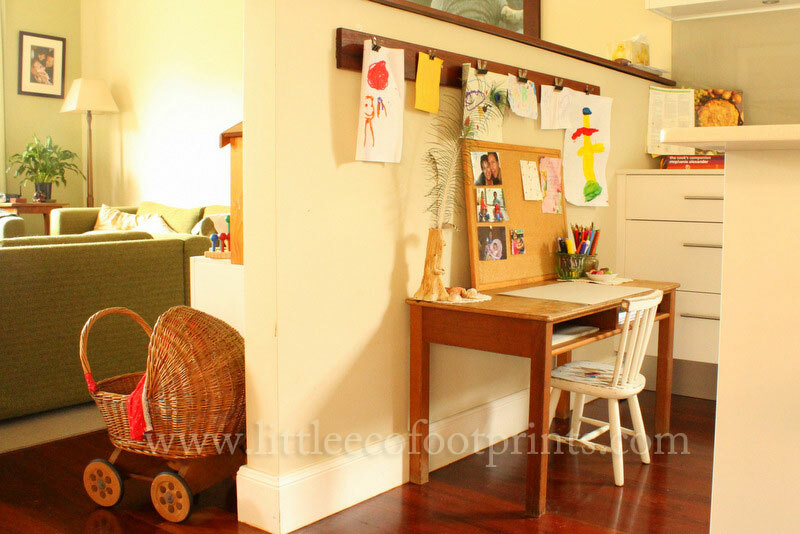 Her craft corner includes child-sized chairs and nearby a set of draws stores craft materials. We try to keep this table clear and inviting. When she was younger I helped her keep it tidy, but now that’s her responsibility. She quickly learnt that a cluttered corner isn’t an inviting space and she (still with a little persuasion) tidies up after herself. Pencils, textas, and paper sit invitingly ready for use at her desk. Like her craft corner – her desk is a prominent feature of our living area, rather than tucked away in her bedroom. My daughter is a fan of messy painting, so it’s an activity mainly undertaken outside. Her brushes, paints and a jar for water sit in a basket ready for her to carry outside whenever she chooses. Admittedly, allowing free reign of craft and art material has led to some mess and chaos, but nothing that couldn’t be cleaned up. The benefits to nurturing her independent creativity far outweigh any short-term inconvenience. Now it’s time to play tag!! You go on over to www.picklebums.com and you’ll find MY post! That’s right, I’m tagging myself! I’ll see you there! We are just getting to the point here when everyone is old enough (ie the toddler no longer wants to draw all over the walls or cut his own hair.. mostly) to have more free access to art supplies. My kids have always had free access to most craft supplies, though they are currently mostly still put away from the toddlers reach, but I am loving thinking about ways to set up spaces and allow my kids more access in the very near future! There are some great tips here, I love seeing what my little one comes up with on her own. She has the best creative ideas 🙂 I learn a lot from her! We have free access to most to drawing materials, glue and scissors but I do need to get better at having dedicated spaces for the art magic to happen. We have wonderful creative messes happening regularly here too! With a just-now-mobile baby in our family we are having to reassess the organisation of our art materials, especially as she shows signs of enjoying creating as much as her bigger sister does! Love your site. Very well laid out and pleasing to look at. Great job! Loved the article. I really believe we are all born creative, but sometimes life gets in the way and we may be discouraged from expressing ourselves. Encouraging our kids to explore and design things that come from their hearts, without telling them any “you shoulds” or “dont do thats”, is the greatest gift ever. Love the article. There is an excellent talk on TED about this very topic. 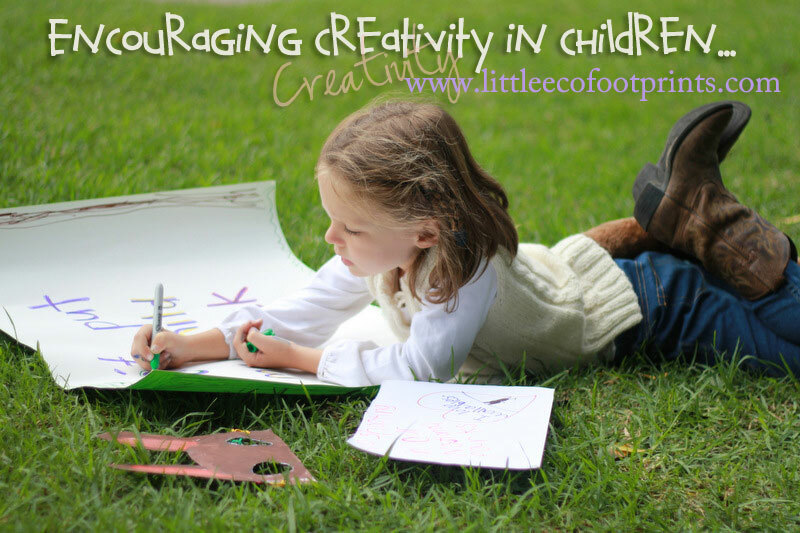 We should be encouraging and nurturing the creative side of our children! !